Let's hear it for the girls: This month The Armenian Little Singers take part in their first tour of Japan. The Armenian Little Singers choir — whose repertoire includes classical songs, modern music, jazz and bossa nova — are performing in Japan for the first time. 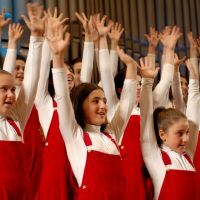 The singers — 40 girls aged 11 to 18 — are all students of music schools in Yerevan, the capital of Armenia, the mountainous landlocked nation that sits along the old Great Silk Road and between the Black Sea and Caspian Sea. The group was originally established by Tigran Hekekyan, Professor of Choral Conducting at Komitas State Conservatory in Armenia, in 1992, and it has since won many awards at international chorus competitions, says Min-On Concert Association, the choir’s Japan tour organizer. It also tours Europe and the United States every year. For this extended tour in Japan — which includes 16 venues, some of which have already sold out — the girls will sing several hymns such as “Ave Verum Corpus,” as well as a George Gershwin medley, “The Girl from Ipanema,” “In the Mood” and other popular songs.